A few more pics from Tahoe! 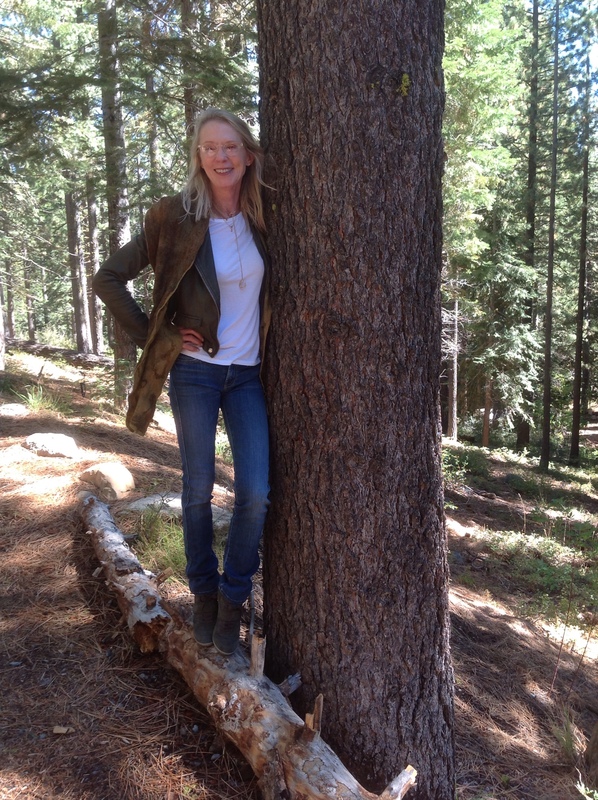 Having a ball with Merridee, Susan and Dale in Mendocino, just wanted to post another few pics from Tahoe today! Tina with her fab nuno felt scarf naturally dyed with onion skins (mordanted with Alum) then modified with iron. 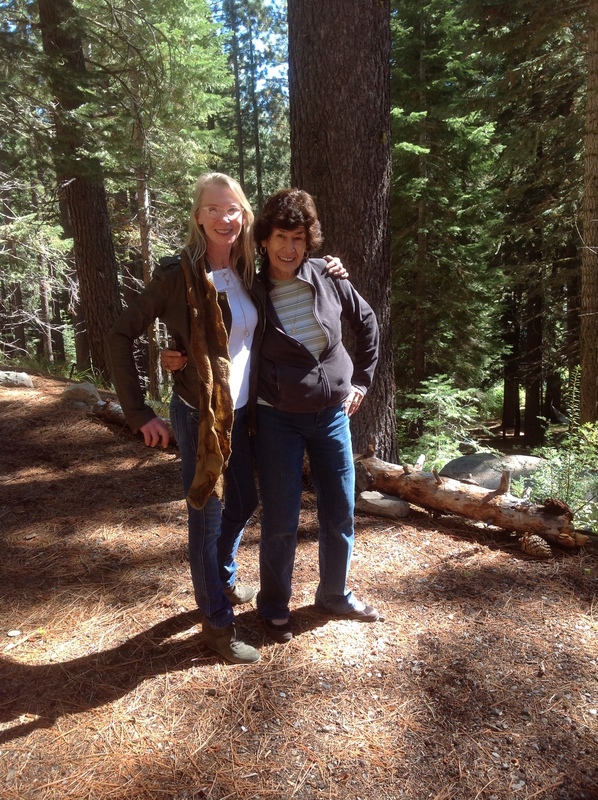 Tina and Lupe at the of a fun and active retreat! 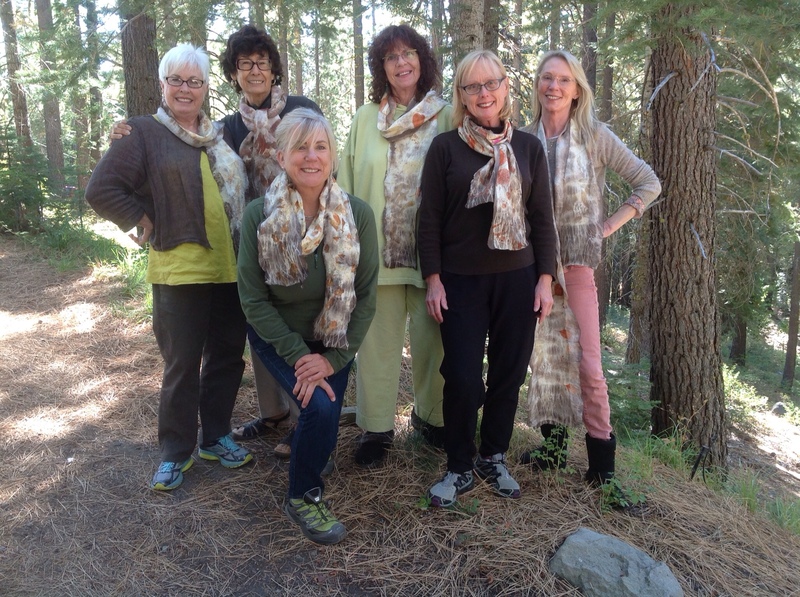 Wonderful participants from Lake Tahoe and last minute accommodation available at Mendocino! 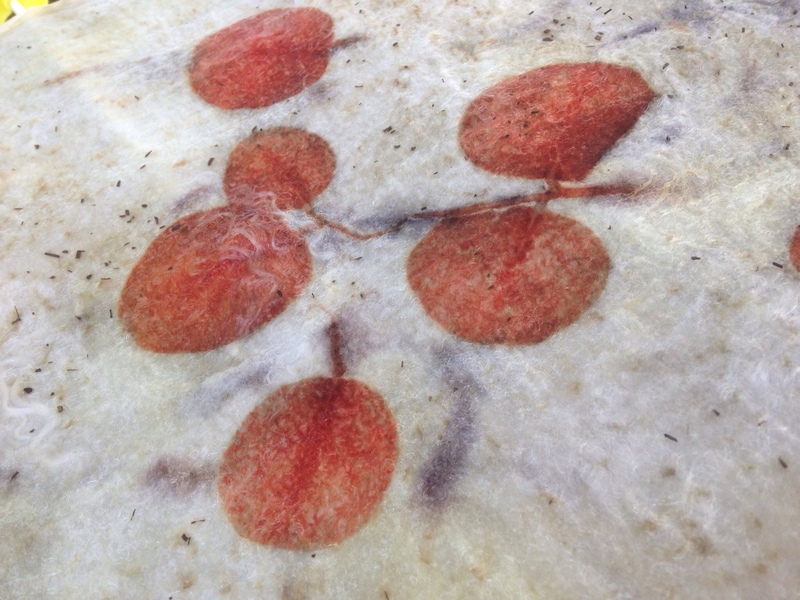 Merridee, Keith and I have just returned from our action packed felting and natural printing retreat at Lake Tahoe so I'm finally online again after an Internet blackout for the last week. It's going to take me days to recoup and catch up with things but I really wanted to post a picture of our wonderful participants to whet your appetite for more to follow! 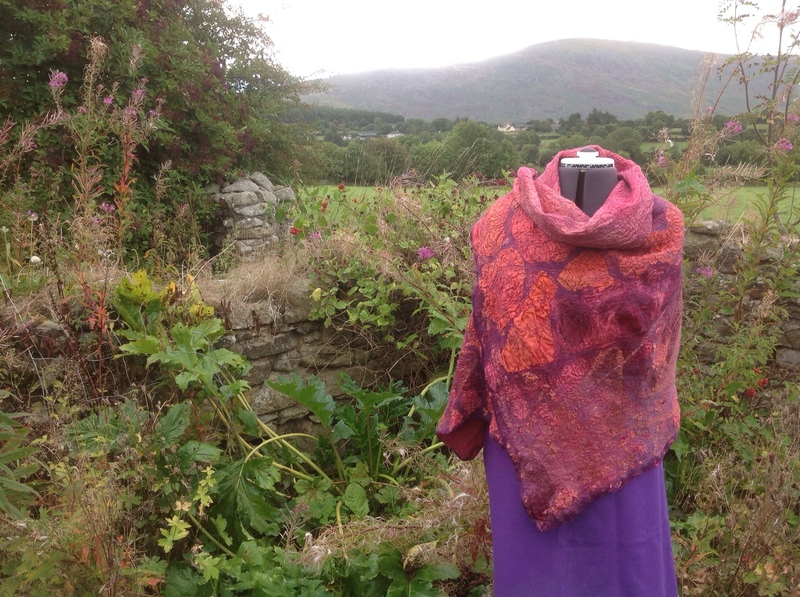 From left to right, modelling their first completed nuno felted and printed scarves………. Mariou, Lupe, Julie (kneeling), Leslie, Patty and Tina, great job everyone!!! There's one room unexpectedly available at the Mendocino Art Center for the three day felting extravaganza this coming weekend (I'm staying with friends of Merridee's therefore the room they had reserved for me is free!) so if anyone is debating considering joining us and felting like crazy, now is the time to shout out loud! 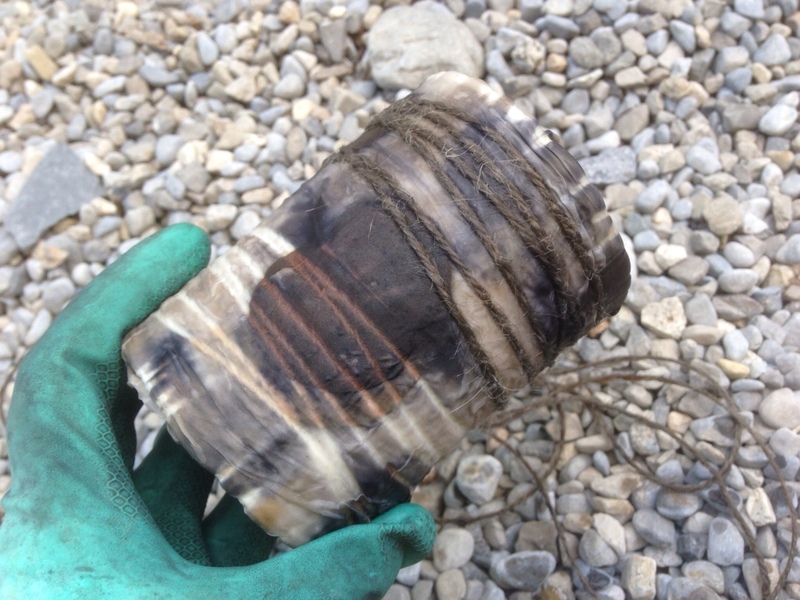 Lake Tahoe, Vancouver and Winnipeg felters, please don’t forget your onions! I thought that I'd take a picture of some onion skins on Thursday night, just to show all of you who'll be joining me in Lake Tahoe or Canada the ones that I find give the absolute best prints. 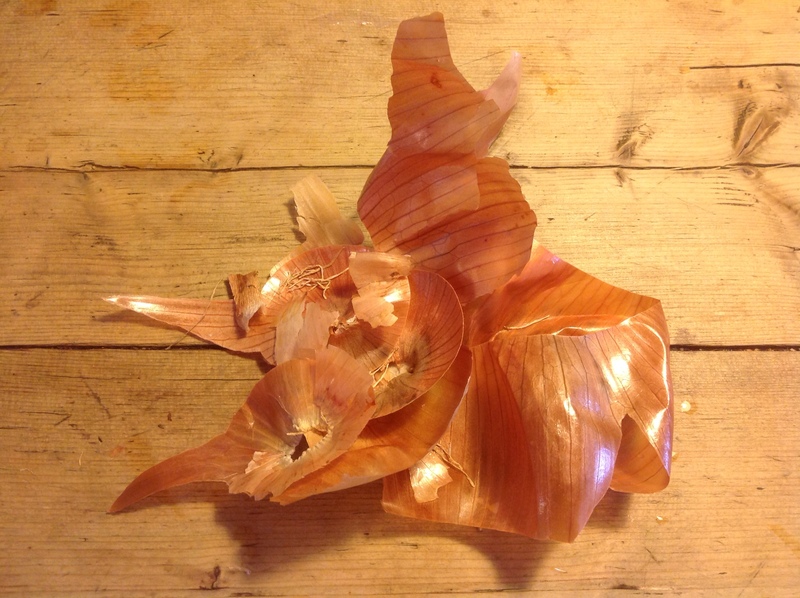 Strong, tough brown onion skins are my preference, the thicker the better, red onions give a similar colour but in my experience the lighter papery skins of some US onions don't impart such a strong colour. 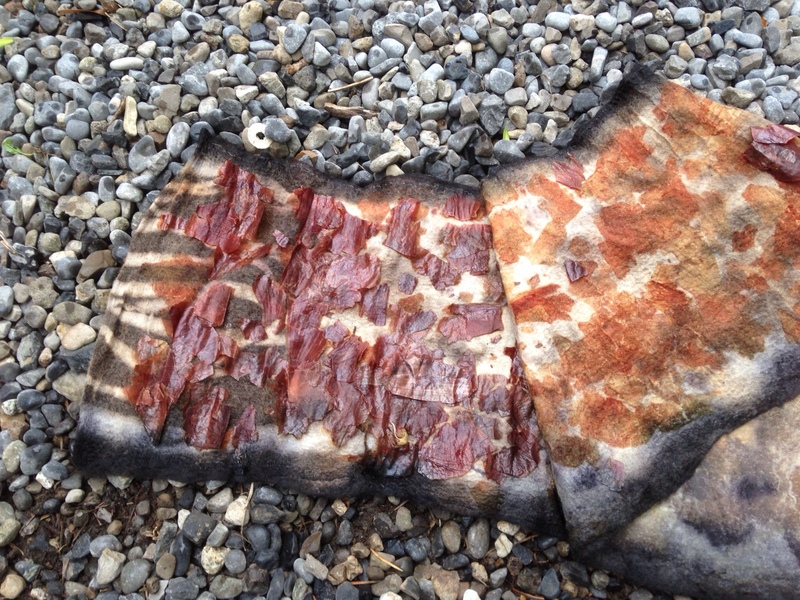 So, if you're planning on bringing some onion skins to any of the above mentioned workshops, and I do hope that you are, please, please try and get the toughest old skins that you can!!! and print fabulously on Manila luggage tags too! From the eucalyptus side of things 'Silver Dollar' is the round variety that gives wonderful orange prints, I usually have to order it from a florist in Ireland although good friend Anita now has a hot line to five trees! 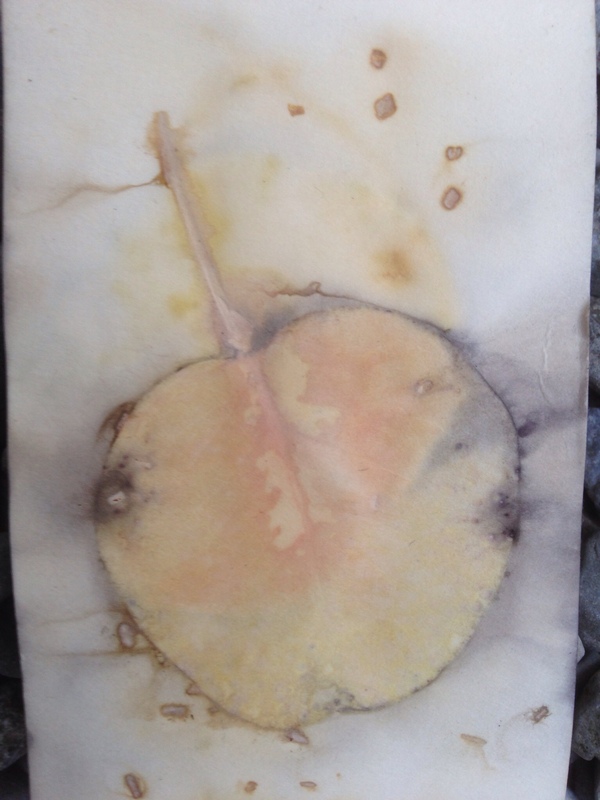 Here it is used to print a luggage tag…..
and a ponge silk scarf. 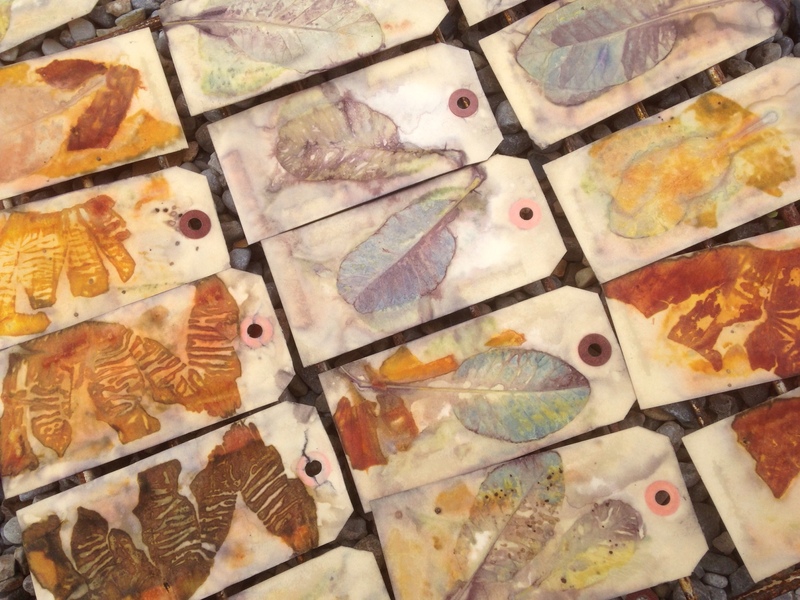 This one was wrapped around an old tin can before dropping in the dye pot, I just LOVE the speckles this gives to the leaf prints!!! 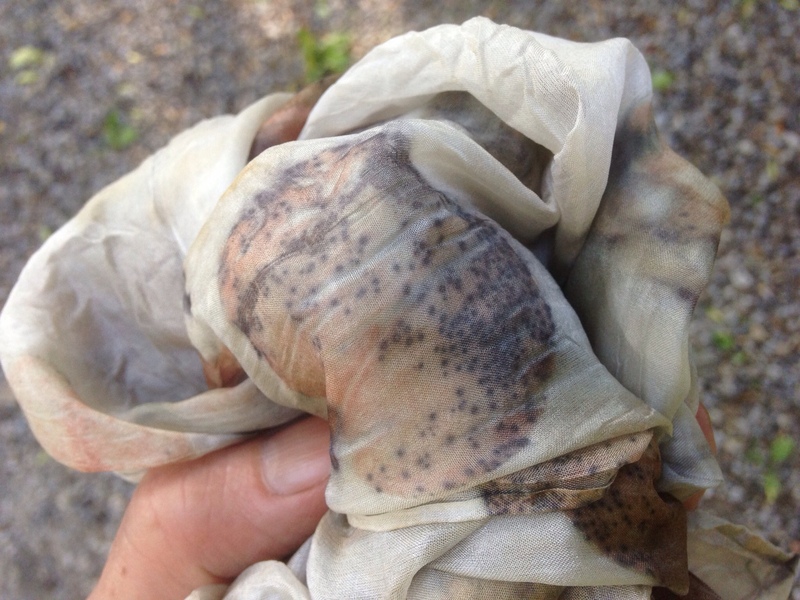 Packing plus a Mendocino felting extravaganza suggestion! As I gather my clothes, samples and supplies ready to pack for my exciting trip to California and Canada I'm doing what I always do, trying to keep my suitcases light! 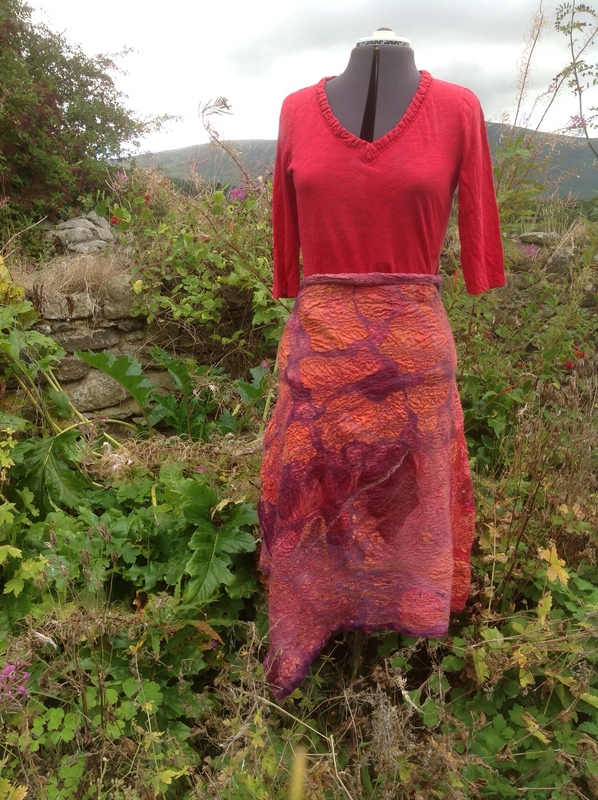 One of the things that I'll definitely be packing is this large multifunctional nuno felt wrap made yonks ago, it's marvellously light and warm thrown around the shoulders but because of the curve I created along one edge also works well as a skirt if needed. It's also going to fit in perfectly with the new Autumn/Winter colour scheme I'm hoping to wear, red, purple and orange with just a few touches of black and lime green! It got me thinking about how much I'm looking forward to revisiting Mendocino, the landscape, coastline and beautiful setting of the Mendocino Art Center are all so inspiring and I can just see myself felting another large wrap while I'm there, maybe in abalone colours this time! For those of you who will be joining me (and my super assistant Merridee) to participate in the three day felting extravaganza from 27th to 29th September we have plenty of time to tackle larger projects, this wrap has oodles of texture and was felted using the tumble dryer method so none of the traditional rubbing and rolling. I also used a technique when felting it which I'll share during the workshop for cutting out precisely shaped pieces of lightly woven fabric, ideal if you have a design in mind and you want to be really controlled in your detail. Although my design for this one may look very random it actually was not, surprised? Sooooo, if you'd like to experiment with larger nuno felt wraps, shrugs etc. at Mendocino, this is your chance. Another thing that I'm looking forward to felting is a new red or purple shoulder bag for myself plus some smaller three dimensional pieces of jewellery. Because of all my preparation for the Glucksman Craft Fair at the beginning of November I do seem to have been felting a lot in white recently, obviously this was because I've subsequently naturally printed these pieces and white was the way to go. Mendocino is the perfect excuse to burst out with glorious colour, bring it on!!! 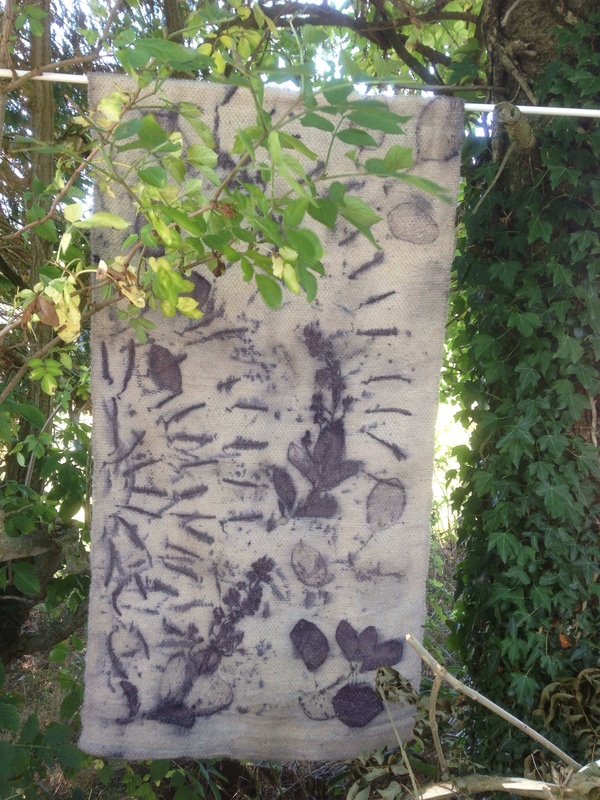 Natural printing and sewing, a fun and instructive exchange of skills! 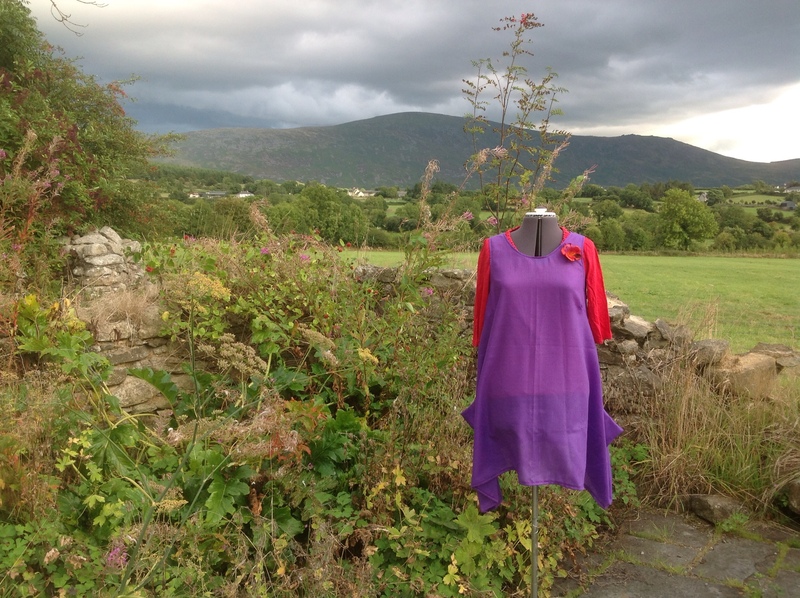 Over the last few days good friend Maureen helped me sew my first ever proper garment, in exchange I shared how I go about my natural printing and helped her print some beautiful nuno felt and silk scarves! 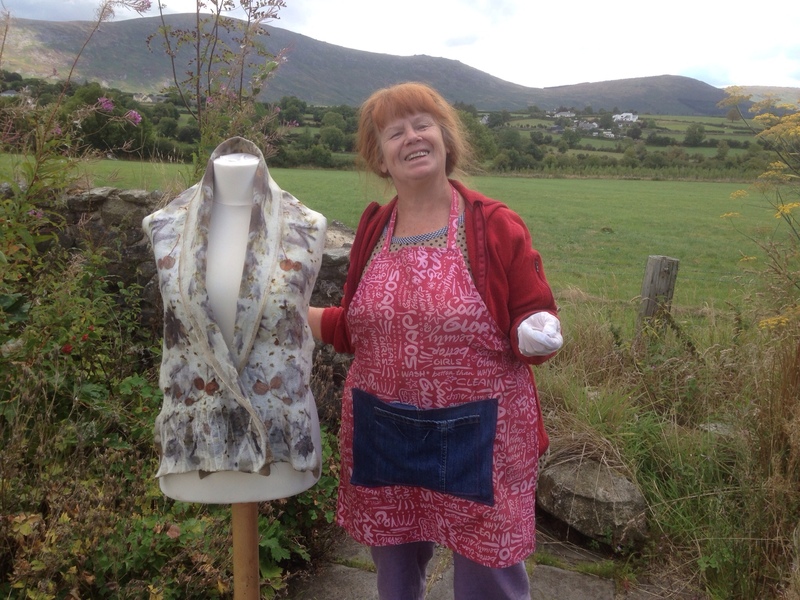 Here's a picture of Maureen with her fabulous first felt wrap out of the dye pot………. and here's a picture of my new merino dress, perfect for layering with leggings and a long sleeved T-shirt in Canada methinks!!! I'm off now to take a wall hanging out of the dye pot and try to sort out some paperwork. 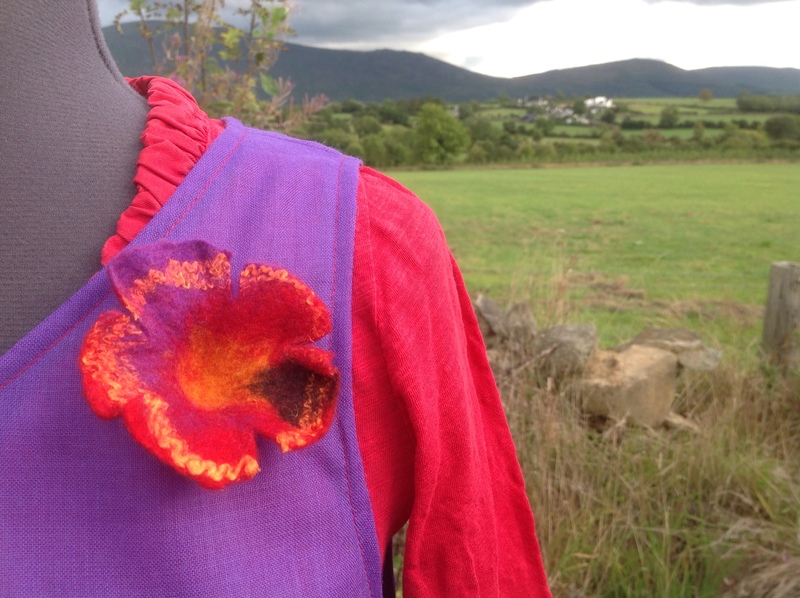 I'll leave you today with a close up of the stitching and a felt flower, I love how this flower I felted two weekends ago absolutely picks up the red and purple colours perfectly. These days I seem to be doing a lot of preparation, all good! I'm…..
wondering how much colder it'll be in Vancouver and Winnipeg than CA and trying to work out what I'll need to pack for my trip! All this is in addition to the usual teaching, market and DG so yes, it's busy here at Clasheen! Here's a picture of some new gift tags drying (prior to ironing) followed by a shot of a printed woven wall hanging fresh out of the dye pot today.